He also made decoration and advertising. 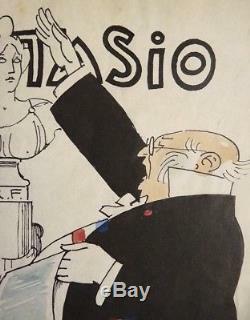 He worked for many illustrated newspapers: laughter, the cry of Paris, the smile, the butter plate, fantasio ... 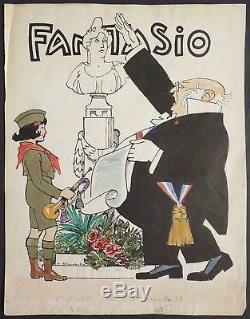 The drawing: original drawing of auguste roubille for a cover of the newspaper fantasio (about 1930). Size: 31.2 x 24 cm. Some creases on the edges. Hand delivery possible paris 9th. The item "blanket august roubille original drawing journal fantasio v. 1930 art deco" is on sale since Monday, July 30, 2018. It is in the category "art, antiquities \ art of the twentieth, contemporary \ drawings, wash". 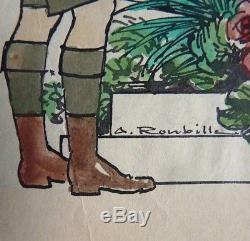 The seller is "dessinoriginal" and is located in / in paris, ile-de-france. This item can be delivered anywhere in the world.